Northern Illinois University Athletics is partnering with the NIU Student Association (SA) and Student Involvement and Leadership Development (SILD) to provide transportation to students to the Nov. 9, Chi-Town Showdown football game at Guaranteed Rate Field in Chicago. The Huskie football team will be riding a two-game winning streak into the historic contest against MAC rival Toledo, which will be the first-ever football game played at the current home of the Chicago White Sox. Kickoff is scheduled for 7 p.m.
For just $5, students will receive a roundtrip shuttle bus ticket from Huskie Stadium to Guaranteed Rate Field. The shuttle bus will be staged on the east side of Huskie Stadium on Stadium Drive East at 3:15 p.m., Nov. 9, with departure at 4 p.m. sharp. The shuttle bus will arrive in parking lot E at Guaranteed Rate Field at approximately 6 p.m. The bus will depart from parking lot E to return to campus approximately 45 minutes after the end of the football game. 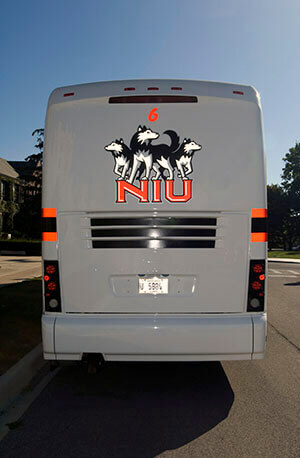 Additional information on the NIU Football Shuttle is available at NIUTickets.com. Admission to the NIU vs. Toledo game is free to NIU students who present their NIU OneCard at the gate at Guaranteed Rate Field. Student guest tickets may be purchased at the ballpark for $22 each (limit two per NIU student). NIU student seating will be in sections 101-107 at Guaranteed Rate Field. Students can enter the ballpark at Gate 2 with the gates scheduled to open at 5:30 p.m.
Additional information about Chi-Town Showdown can be accessed via the event fan guide at niuhuskies.com.